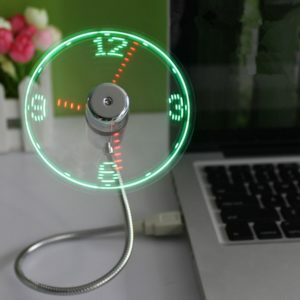 A USB LED Clock Fan is perfect for the office and your desk or Laptop at home. You can easily adjust it to direct a cool breeze in any direction you want. The LED Fan is extremely light weight and also has soft blades on the fan. The soft blades will keep you from getting whacked if you happen to touch them while it’s operating. The only drawback I have found is that You are not able to upload or program personal messages into the fan lights. The clock fan is just exactly that, a fan that displays the time. A simple press of the switch sets this fan into motion and activates the time display. From this point adjusting the time is pretty straight forward and easy to do. Just press and hold the power button and the minute hand will start flashing. Continue to hold the button down and the hour hand will begin to blink and the fan rotates pretty fast. You have to release the button just before the USB LED Clock Fan reaches the correct hour. This is what people are saying about this USB LED Clock Fan. 5.0 out of 5 stars you will love it folks . cool breeze anywhere you wish , you can easily plug into your computer’s USB port, gently adjust the flexible neck to the desired position. I know you will love it , folks. What a neat little fan! Definitely an attention getter!! Works great and produces a fairly good amount of air considering it’s size. Way too cool and doesn’t give me epileptic fits! Easy to program. You can read all of the reviews here. This LED Fan is sure to grab everybody’s attention, and for the price, You can’t go wrong.